One of the best things about Fall Instructional League is the weather. The last few weeks of Gulf Coast League were brutal, mid nineties every day, 90-100% humidity, no breezes. The games started at noon and by one, you felt fried. Fast forward a few weeks FIL starts at one, the temps are mid-eighties, humidity is mid-eighties and the breeze is fantastic. 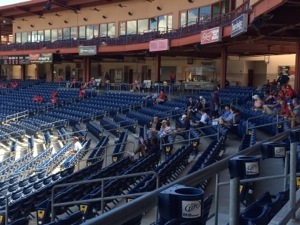 They also have been holding the games at Bright House which allows for seats and shade. Baseball life couldn’t get much better. The baseball? Well it’s, well, interesting. The players are here to work on pieces of their game so the emphasis is on the instruction not winning. Pitchers that were lights out look like their struggling because they may not be allowed to use their “good” pitches. I don’t mind who wins or loses. I’ve gotten to know quite a few of the young players and I quite enjoy watching them learn and progress. It’s also better than what happens in just a few weeks—the end of all of the seasons. That dark dearth of time between the World Series and Spring Training. Well, there is Australian baseball and Baseball Ross and I have gotten up at 3 am to watch some games but it’s not the same. Let’s hope they win in Texas and Cleveland so we can go to the ALDS! I’ve never been to a baseball playoff game, well not a MLB one. Earlier this week, Baseball Ross and I were lucky enough to “win” the ticket lottery for the Tampa Bay Rays and be “given the privilege” to buy play off tickets. So we have seats, just fifteen rows behind the Rays dug out. With the three way tie it’s as confusing as trying to sort out a pile of spaghetti to figure out when/if the Rays will get to play at home and if they do not get to play a wild card game at the Trop, we wonder if our tickets will be converted to tickets when they play again at home. Ahh, fall is in the air! The air is cool, low to mid 80’s, mostly sunny, nice breezes such a changed from the mid-90’s and stifling air of the Gulf Coast League. The Fall Instructional League got off to a late start as the first several days of play had to be postponed/cancelled due to severe rain. Yesterday was the first game that we were able to attend. It’s been interesting to watch because several of the players who will be playing in the Arizona Fall League have made a stop here in Clearwater to get tuned up before heading West. They played my hometown Dunedin Blue Jays. During the game, I got to see Kelly Dugan bat. The game itself was rough to watch with the Phillies losing 8-6. The Orioles, today’s opponent, had not played in SIX days. 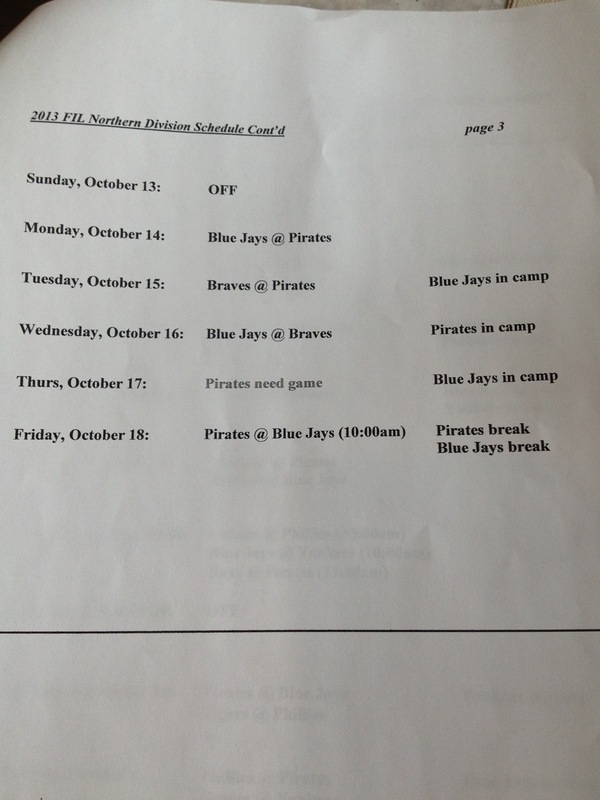 In this short league, approximately a month (depending on team) a loss of six days is detrimental to a team. Today’s game was a scheduled twelve innings to help the Orioles get in much needed work. What I liked about today’s game was the fair number of Arizona Fall League players who played today. Those players are leaving today for Arizona so many of them got in one last practice before leaving on a jet plane. Kenny Giles started. While I understand why some people may have some concerns about him, I still get a kick out of watching him pitch. When I’ve seen him play in Dunedin (one of the few stadiums with a radar gun) He’s thrown over 100mph. While today’s game at Bright House lacked a gun, I loved to hear the ball snap against the catcher’s glove. There’s a certain pop when a ball really has velocity and you can hear that with Giles’ pitching. I also got to see Luis Encarnacion’s first game as a Philllie. If you want to see video of his first hit or an amazing bare-handed grab you can go to Baseball Ross’ Blog HERE. Kelly Dugan played, Austin Wright and Kyle Simon pitched, so who needs to go to Arizona to see some of the best Arizona will have to offer? The game itself was however disappointing in score, with a final of 9-1 in favor of the Orioles. The twelve innings went just over four and a half hours, not bad for free baseball. The weather was perfect. So I guess a “bad day” of baseball is better than the best day of almost anything else, I’m not complaining. Tomorrow is an off day as they do not play on Sundays. I’ll be back on the beat Monday. 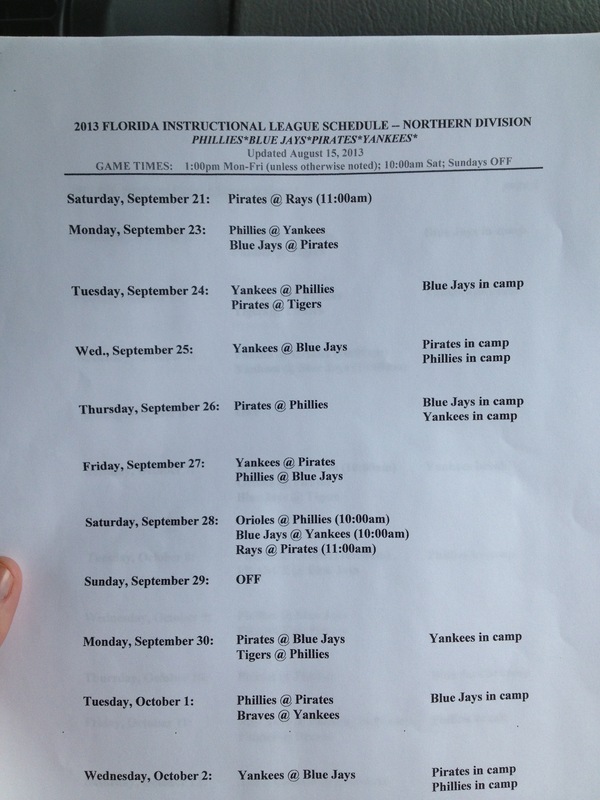 I was able to get my hands in a copy of the schedule for the Fall Instructional League, roster not yet available. I hope to get a roster early next week and will post as soon as I do. Ok, it’s not the end of the world, but it is the end of the “ticketed” baseball season for me, in all likelihood. 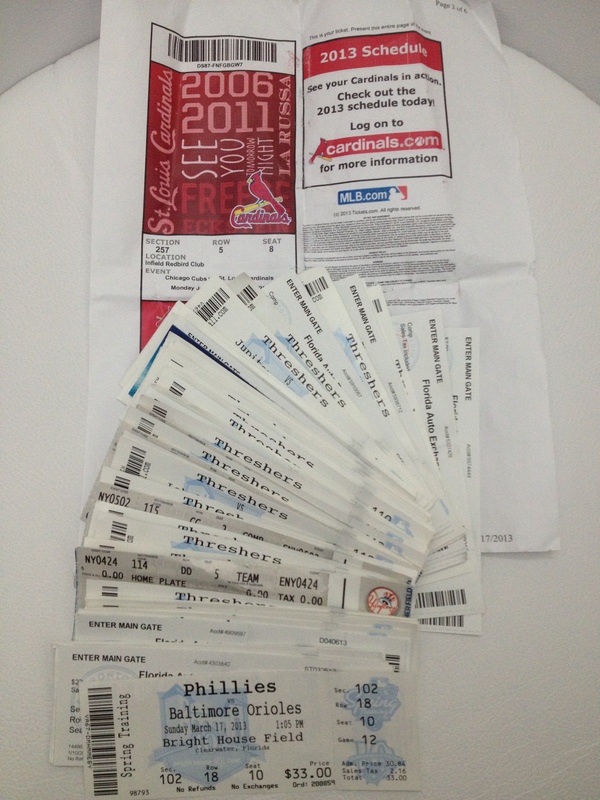 So these are all my tickets for the games we paid for this year (minus a couple that ended up in the laundry). What I have here is SIXTY-SEVEN tickets. This does NOT include all the free/unticketed Spring Training, Extended Spring Training, or Gulf Coast League games! I think I can honestly guesstimate that Baseball Ross and I went to over 140 games this year. Ross even more than that, as there were a couple of games I missed for either illness, another commitment or when I was away on vacation. 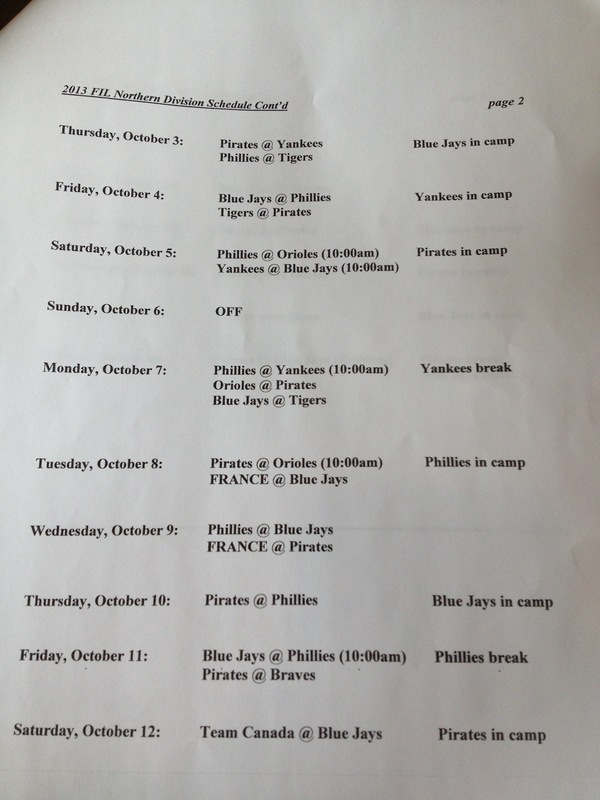 With Fall Instructional League coming next week, I will add a couple more games to that list…. My project for next season is to buy a journal and log every game I go to. That way I will have an accurate accounting of how many games I’ve actually attended. It’s been a memorable year. I got some of the autographs I’ve really coveted, Jimmy Rollins and Carlos Ruiz, I got to know some really great players and it’s all been one amazing year. In the coming days I will be posting my end of the season articles….and with the year we’ve had, there’s a lot to cover….